Not to be confused with Holy Crown of Hungary. The original Hungarian Regalia were handed over by Queen Isabella Jagiellon to Ferdinand of Austria in 1551, when she was forced to leave Transylvania, which fell into Ferdinand's hands in accordance with the treaty of Nyírbátor. According to a contemporary Polish chronicler, she broke the cross off the Crown of Saint Stephen’s peak for her son, John Sigismund Zápolya. The copy of the main Hungarian insignium was probably made at that time. After John Sigismund's death the crown was inherited in 1571 by King Sigismund II Augustus of Poland, Isabella's brother. 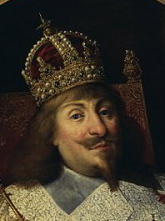 The Polish king treated the crown of Hungary as a family keepsake, and kept it in a private vault in the Tykocin Castle. In 1572, when the last of the Jagiellons died the insignium was used as an exequial crown during the funeral ceremonies to Sigismund Augustus in Knyszyn and eventually passed to his sister Anna Jagiellon. After the king's death the opposition led by the primate, made the guardian of the Wawel Royal Treasury, refused to bestow the Polish royal insignia on the newly elected Anna Jagiellon and her husband Stephen Báthory. Unable to use the Crown of Bolesław I the Brave, Báthory used the Hungarian Crown as an alternative. In about 1576 the crown was bequeathed to the State Treasury at the Wawel Castle, where it was kept until October 1795. It was then stolen by Prussian soldiers after the seizure of Kraków by the Prussian army, and was appropriated to the collections of the Hohenzollerns in Berlin. After 1809 it was destroyed, as was the majority of Polish regalia. The Hungarian Crown was made in the form of rims topped with a globe and a cross at their intersection. It was decorated with enamel plaques, filigree work, pendants and precious stones including four large sapphires and rubies. In the 18th century the crown was depicted in the portrait of Louis I of Hungary by Marcello Bacciarelli, painted to embellish the Marble Room at the Royal Castle in Warsaw. ^ a b Margaret Odrowaz-Sypniewska. "Poland's Crowns". www.angelfire.com. Retrieved 2009-02-16. ^ a b c d e f Jerzy Lileyko (1987). Regalia Polskie (Polish Regalia) (in Polish). p. 90. ISBN 83-03-02021-8. ^ a b c d e f g Michał Rożek (1987). Polskie koronacje i korony (Polish coronations and crowns) (in Polish). p. 80. ISBN 83-03-01914-7. Christopher Báthory was voivode of Transylvania from 1576 to 1581. He was a younger son of Stephen Báthory of Somlyó. Christopher's career began during the reign of Queen Isabella Jagiellon, who administered the eastern territories of the Kingdom of Hungary on behalf of her son, John Sigismund Zápolya, from 1556 to 1559. He was one of the commanders of John Sigismund's army in the early 1560s. Bona Sforza was Queen consort of Poland and Grand Duchess of Lithuania. A member of the powerful House of Sforza, which ruled the Duchy of Milan since 1447, she became the second wife of Sigismund I the Old, the King of Poland and Grand Duke of Lithuania in 1518. Their marriage lasted 30 years until Sigismund's death in 1548. Ambitious and energetic, Bona became heavily involved in the political life of Poland–Lithuania. To increase state revenue, she implemented various economic and agricultural reforms, including the far-reaching Wallach Reform in the Grand Duchy of Lithuania. Her reforms made her the richest landowner in the Grand Duchy. In foreign policy, she opposed the Habsburgs and sought to secure her eldest daughter Isabella Jagiellon in the Kingdom of Hungary. Isabella Jagiellon was the oldest child of Polish King Sigismund I the Old, the Grand Duke of Lithuania and his Italian wife Bona Sforza. In 1539, she married John Zápolya, Voivode of Transylvania and King of Hungary, becoming Queen consort of Hungary. At the time Hungary was contested between Archduke Ferdinand of Austria who wanted to add it to the Habsburg domains, local nobles who wanted to keep Hungary independent, and Sultan Suleiman the Magnificent who saw it as a vassal state of the Ottoman Empire. While Isabella's marriage lasted only a year and a half, it did produce a male heir – John Sigismund Zápolya born just two weeks before his father's death in July 1540. She spent the rest of her life embroiled in succession disputes on behalf of her son. Her husband's death sparked renewed hostilities but Sultan Suleiman established her as a regent of the eastern regions of the medieval Kingdom of Hungary on behalf of her infant son. The region developed as a semi-independent buffer state noted for its freedom of religion. Ferdinand, however, never renounced his claims to reunite Hungary and conspired with Bishop George Martinuzzi who forced Isabella to abdicate in 1551. She returned to her native Poland to live with her family. Sultan Suleiman retaliated and threatened to invade Hungary in 1555–56 forcing nobles to invite Isabella back to Transylvania. She returned in October 1556 and ruled as her son's regent until her death in September 1559. Wawel is a fortified architectural complex erected over many centuries atop a limestone outcrop on the left bank of the Vistula river in Kraków, Poland, at an altitude of 228 metres above sea level. Barbara Zápolya (1495–1515) was Queen of Poland and Grand Duchess of Lithuania as the first wife of King Sigismund I the Old. Marriage to Barbara represented an alliance between Sigismund and the House of Zápolya against the Habsburgs in succession disputes over the throne to the Kingdom of Hungary. The alliance was short-lived as the renewed Muscovite–Lithuanian War forced Sigismund to look for Habsburg allies. The marriage was loving, but short. Barbara was the mother of Hedwig, Electress of Bradenburg, but died soon after the birth of her second daughter Anna. The Jagiellonian dynasty was a royal dynasty, founded by Jogaila (the Grand Duke of Lithuania, who in 1386 was baptized as Władysław, married Queen regnant Jadwiga of Poland, and was crowned King of Poland as Władysław II Jagiełło. The dynasty reigned in several Central European countries between the 14th and 16th centuries. Members of the dynasty were Kings of Poland, Grand Dukes of Lithuania, Kings of Hungary, and Kings of Bohemia.